Thanks to all for good forum discussion. In my case I have calculated that 1°shift can be achieved by move of the “mirror” support about 15mm towards front or backwards at the base of wooden plate, (no need of digital protractor). 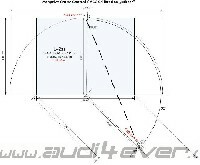 Alu - Gussräder Audi Exclusive 19"